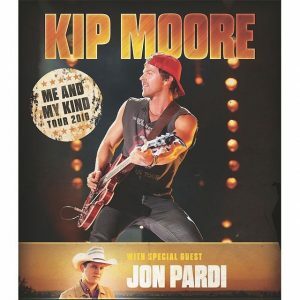 Kip Moore is currently out on the road headlining his “Me And My Kind” tour with Jon Pardi, and for select dates, Will Bowen. Last Thursday, the tour stopped in Lowell, Massachusetts (just outside Boston) to play at the Tsongas Center. 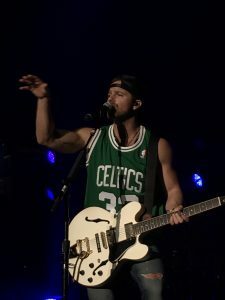 Kip has an affinity for the city of Boston and with a very strong fan base in the area, consistently sells out his shows there. In fact, at the show I met up with fans from across the country who flew in or drove many hours to attend the show because it was in Boston. I met fans who came in from North Dakota, Colorado, South Carolina, Tennessee, Florida, Pennsylvania, New York and New Hampshire. The VIP experience is always something special and this was one of the best I’ve experienced. The ticket description says fans will enjoy a 2 song acoustic performance, but Moore always goes way beyond. He takes fan requests and is often stumped by die-hards who throw out titles he admittedly has a hard time remembering the lyrics to, but tries regardless. During this VIP set he played a 9 song set which included a few new tunes and he paused to share some of the stories behind his lyrics. While playing “Guitar Man”, he told the crowd the song will be on the new album due out in 2017 and went on to explain that he remembers “being the faceless, nameless guy on stage…and it can be a lonely, lonely journey”. Closing out the acoustic VIP set with the anthemic, “That Was Us”, as he explained how he had to fight to get the song on his ‘Wild One’s album. Moore said “I refuse to sing songs I’m not passionate about and that’s one of them”. Before leaving the stage he thanked the crowd and said “Boston, you always show me your heart”. Singer/Songwriter Will Bowen took the stage next to warm up the crowd with a short but very impressive acoustic set. Bowen has a gritty sound that exudes emotion. While he may not be a well known name, he’s already found a great amount of success in other genres and even has a Grammy nomination. 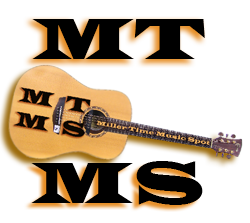 He’s signed to Little Extra Music and is currently working with many top artists in Nashville. Bowen also showed his love for the city of Boston by showing the crowd his Larry Bird socks. 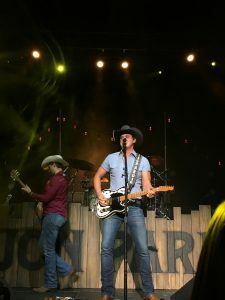 Next up was Jon Pardi. Pardi has had recent radio success with songs such as “Head Over Boots”, “What I Can’t Put Down”, “Dirt On My Boots” and “Up All Night”. While the majority of the crowd seemed to sing along to most of his set, I was not very familiar with most of the songs. 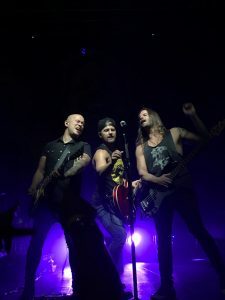 Kip Moore took the stage around 9:30pm and true to his nature he and his band “The Slow Hearts” came out ready to rock the crowd opening with “Lipstick”. The crowd especially enjoying the line “Way up above Dixie, Boston, Jersey, New York City”. He played a mix of old and new songs even covering the Jimmy Eat World hit “The Middle”. 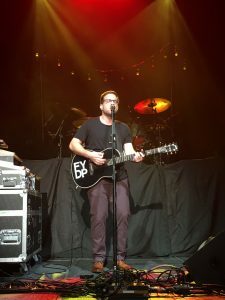 He then transitioned into an more relaxed, acoustic vibe playing tunes such as “Running For You” and “Hearts Desire”. All the while the crowd sang almost every word back to him. Moore then left the stage briefly to return (wearing his beloved Larry Bird jersey) with his full band for a high energy 5 song encore finishing with “Dirt Road”. Throughout the entire show, Moore took many opportunities to thank his fans for all of the support they continue to show him. Explaining that money isn’t what fuels him, it’s the fans that come out show after show and show he and the band how much they relate to his music. 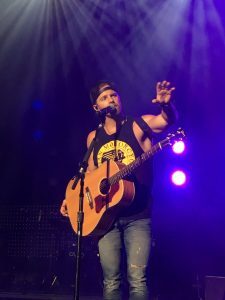 Having attended many, many Kip Moore shows, Boston is always one of my favorite venues to see one of his shows in and this was certainly no exception. It’s clear that he feels something for the city and his fans there. Once again in an effort to show his appreciation for his fans Moore stayed after the show to sign for every single fan at the merchandise booth. I’ve got to tell you, that’s dedication and appreciation! Having just played for almost two hours and leaving everything you have out on stage to then stay until the last fan meets him is something unique. He’s a class act in an industry that currently seems to be overwhelmed with radio sell-outs. Moore is an artist who stands up for and makes the music he believes in. Bottom line-do whatever it takes to get to a Kip Moore show, you won’t be disappointed!